How can automation prevent allergen-related product recalls? With allergen-related product recalls on the rise, food manufacturers are under increasing pressure to ensure products are correctly labelled. But why do these errors occur in the first place? We spoke to Faye Louch, OAL Connected’s Trainer, to understand the problems and how automation can help. Why is the risk increasing? These days packaging has a lot more artwork on which is regularly changed and updated . Every time a new version of packaging is released, there is a potential to introduce an error into the labelling system. This could be as simple as a missed ingredient or misprinted code. New product formulations can mean that a small change to the ingredients may introduce allergens that were not there before. When this happens it is easy to miss the allergens when updating the ingredients, particularly if the packaging's artwork has not changed. Walk down any supermarket aisle and you'll notice a lot of food packaging can look alike. Retailers attract consumer attention by making products within a range look eye catching and similar, so when the packaging is on the line it can be difficult for an operator to distinguish between an allergen-containing and non-allergen containing product. How can OAL Autocoding help? 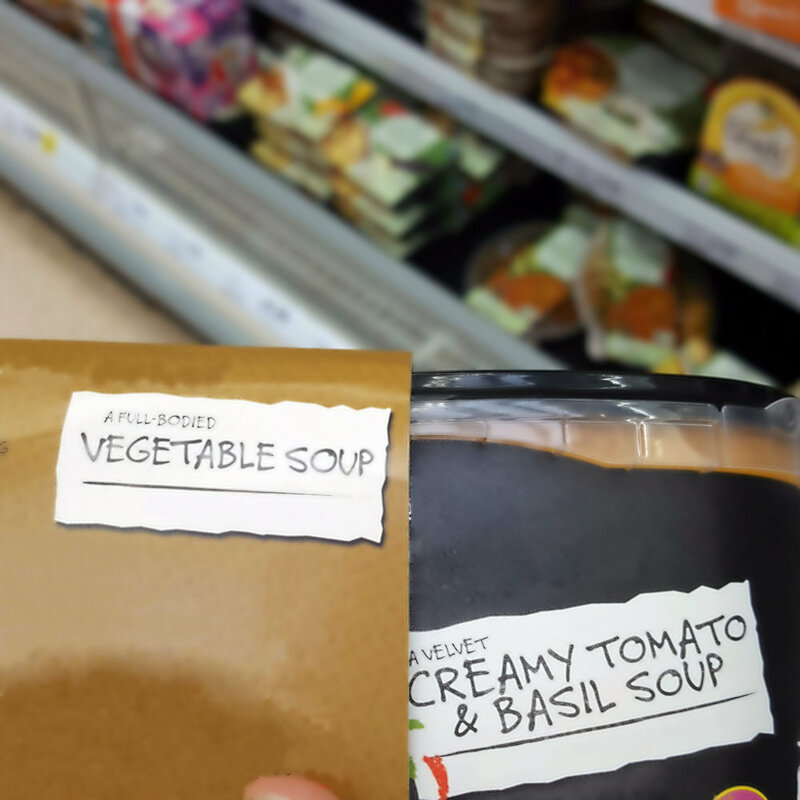 An example of a tomato soup incorrectly packaged in a vegetable soup sleeve. OAL Autocoding controls and automates the set-up of your packaging line devices from a master database of products defined by your technical team. The system scans every product to ensure the correct packaging and date code is applied. During the product set-up within the system database, the artwork version code gets programmed. This tells the scanner the information it needs to look for to identify that the right packaging has been used. The scanner will give a mismatch and stop the line instantly if it sees anything other than this pre-entered information preventing incorrect packaged product leaving the factory. Codes contain letters and numbers and the information must be must be printed exactly, including capitalisation e.g. 'P' or 'p'. During the artwork process, occasionally letters and numbers can be missed or incorrectly capitalised causing a mismatch within the system. The mismatch is an indicator that something is wrong in the information that the scanner has seen and requires investigation prior to any product leaving the manufacturing facility. What about our current 1D codes? 1D codes are the product code and are used in store to tell the retailer what you have bought and to aid stock management. The 1D does not alter when the version of the artwork alters, hence the reason and necessity for 2D codes. 2D codes offer version control. If there is a change on the artwork then the 2D code will change. This is how manufacturers control and track the multiple versions of packaging. The OAL system reads every 2D code that passes through the scanner, essentially removing the element of human error from the process and drastically reducing the potential for incorrect packaging and potential allergen related recalls. What are Faye’s top tips? Codes that are too small are unreadable and will give incorrect information; hence why it's important to get your artwork team on-board with 2D code requirements. Secondly, for any products that have sleeves on them, consider printing the allergens on the film of the product’s lid. This is a good second step to alert the customer in case the wrong sleeve has been put onto the product or something happens post-production. The OAL system can do this by adding a second printer to the system to allow a two stage controlled printing process. Stage one allows allergen information to be programmed and printed onto the pack. Stage two is where the date code information is printed onto the pack. Having stage one is important in the control of allergens as it is a fail-safe; in the event the product and sleeve become parted, the allergen is still available as it is printed on the product film. With over twenty years of experience working in the food industry for leading food manufacturers including Bakkavor, Faye has the practical experience to ensure your teams get the most out of your automated systems.